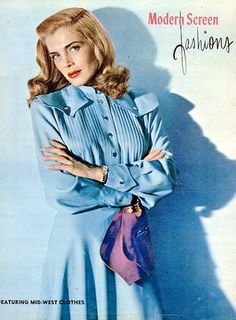 Lizabeth Scott, modeling "Mid-West clothes," for her sins no doubt. This dress is so ghastly it could well have been designed by the Too Late for Tears gown perp. The pleats...the epaulets...what is this dress about? That's a DRESS?? Looks like some strange amalgam of Jane Wyman-inspired western-wear and a polyester house coat. And what is that purple thing? A half made sash? A forgotten luncheon napkin? The handkerchief used to catch her tears of regret over being photographed in this *thing*? It's awful, isn't it? well, you should have seen the costumes in the movie. Even worse. For fashion, I think the period between the end of WW II and the New Look hitting the States is similar to Top 40 radio between about 1961 and the Beatles hitting the States. Sheer, undiluted horror for the most part. Cool blog you have going here, I will check in often! I have a similar site about girl fashion game. It pretty much covers girl fashion game related stuff.